SolarCity has added a new feature to its website — a real-time visualization and data page that shows a variety of information about the company and its customers. Want to know who much clean energy its solar panels have created today? That information is in the left-hand margin. It will also show you the total amount of electricity created this year, how many tons of carbon dioxide have been kept out of the atmosphere, and where the most recent residential solar system was installed. The company has over 200,000 installations, all connected to the internet in order to monitor the energy output of each system in real time. The map demonstrates how all of those solar sites work together to make SolarCity essentially a decentralized electric utility that provides nothing but clean, renewable power. 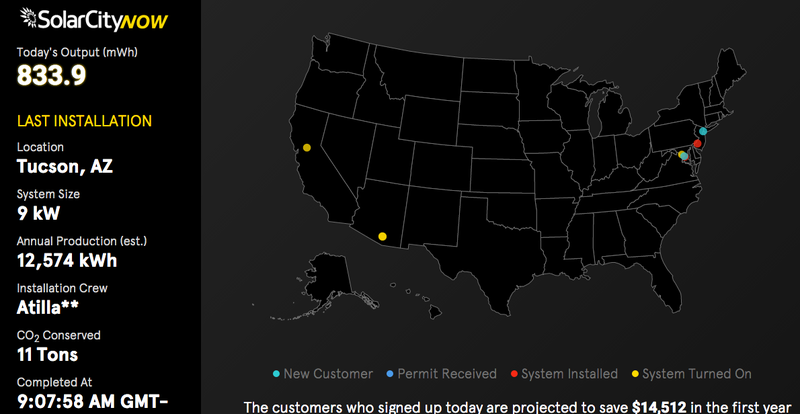 The SolarCityNOW web page puts a dot on the map whenever a new customer signs up with the company, when new permits are issued, and when system installations are completed. According to Electrek, the website also gives information about the latest installations, particularly how much money each will save the homeowner as well as how much CO2 it will offset. SolarCity aims to reach 1 million customers by the end of 2018. The company generated a total of more than 5 megawatts of electricity for the first time on March 31. Since then, it has equaled or exceeded that number on multiple occasions. In fact, according to SolarCityNOW, the company has produced nearly 7 megawatts of electricity today, June 22. Thanks to the SolarCityNOW web page, we can all watch the company grow family by family across America every day in real time. It demonstrates how residential solar energy is growing exponentially and it will help build momentum for further growth. Check it out on your computer at home right now. This is very cool stuff.